To the SCHLOSS Roxburghe Hotel & Golf Course. Start the fall with three friends and our October 4 Ball. Welcome to the SCHLOSS Hotel. Here, in the peaceful, natural surroundings of the Scottish Borders, leave everyday life behind you and find time to connect with your true self. Recharge your batteries in an exclusive environment and experience unforgettable moments in style and luxury. Finally, let us look after you while you indulge in the exceptional culinary offerings with fresh produce from our very own gardens. Follow the sign of nature. The idyllic natural surroundings at SCHLOSS Roxburghe invite you not just to relax, but also to go outside and get active. After all, there is nothing better than testing your physical limits, trying out new and unknown things, and restoring the soul. There are numerous possibilities offered on site, from the Championship Golf Course, to our very own trout pond and fishing beat, not to mention the Roxburghe Shooting School that offers a range of activities including archery, tomahawk throwing and clay pigeon shooting. Leave your everyday routine behind. The completely refurbished and redesigned SCHLOSS Spa is a wonderful place for leaving behind the stress of everyday life, connecting with your inner self, and enjoying some relaxing time out. To help you relax, take advantage of one of our natural treatments, spend time in one of our brilliant saunas and soak up the first-class ambience of the surrounds. The SCHLOSS Spa remains closed until 2020. Take a look at all our news and stay informed about everything about the SCHLOSS Roxburghe. 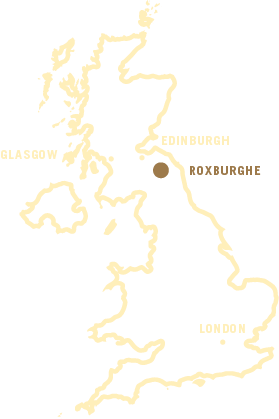 Set in a natural landscape of rolling hills and flowing rivers in the heart of the Scottish Borders, Schloss Roxburghe, a historic property with championship golf course and full range of sporting pursuits offers a getaway destination little more than an hour’s drive from both Edinburgh and Newcastle. The Scottish Borders is steeped in history and populated with distinctive natural landmarks and historic buildings. These combine to create an idyllic rural setting with beautiful and romantic villages to explore and discover. During your time as a guest, here you will find all the peace and relaxation you need to rediscover your true self.